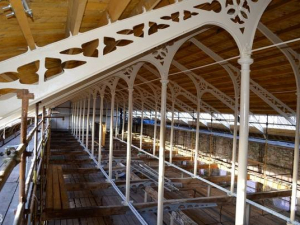 The project involved the restoration of the Grade ‘A’ listed mill building, creating a full height cathedral-like space. The project provides just under 1000m² of new exhibition space to display the museum’s recognised collection of National Significance and the restored Dundee’s Leisure & Culture 1801 Boulton & Watt steam engine, an internationally important object. The facility also provides a new history hub and a ‘Red Box‘ Learning pod where a wide variety of groups can meet to take part in heritage – based activities. Winner DIA Awards 2015 for Best Rehab/Rejuvenation Project. RIAS 2016 Award for best Historic Conversion and Climate Change Building, Award 2017 for its Outstanding Contribution Townscape of Dundee.